Allie Goldstein: This is Allie Goldstein and Kirsten Howard of Adaptation Stories. On June 3, 2013, we visited Island Park, New York on the South Shore of Long Island. We met with David Schieren who cofounded Empower Solar along with Greg Sachs in 2003. Empower’s core business is the design and installation of solar power systems, which they do across New York City and the surrounding region. That business was compromised—temporarily—when Hurricane Sandy hit New York on October 29, 2012. We spoke with David about Empower’s story of resilience, which had some surprising twists and turns. I’ll let him tell it to you. David Schieren: Towns around here were devastated. In this office we received an inflow of about three feet of water. So desk height. Greg, who is my business partner, was here that night. I was at a different location. And he was on this table and he could just touch the water here. We suffered a pretty severe economic hit and then on top of that we had a lot of displaced employees, including myself, including Greg. It was October 29, my birthday. I was able to order pizza that day. That was a huge deal for me. I said, ‘Are you guys really delivering today?’ Yea, we deliver. AG: So David was able to get his birthday pizza, even in the middle of a hurricane. But after that, Empower faced some tough decisions. DS: We didn’t want to lay anybody off. That’s terrible. So what do you do? We’re a strong small business. And we set a goal to get up and operational right away. We basically paid our staff to help fix the office—that was priority one—but we also set up satellite offices. We were operating from several satellite offices, which in effect were employees’ homes. AG: But with the water of Hurricane Sandy, there was also the problem of fire. DS: So the other element that was very difficult for us was that we had clients, I think the total was about 40 homes, on the South Shore that had their electrical systems flooded. When electrical is flooded with salt water, that creates a hazardous condition. Fires. There were a lot of fires. Fortunately none of our installations. Because, the two days after the storm, we set people out in private vehicles, without billing anybody. We had to shut down systems. We had some really sad stories like some clients’ homes that were in contract, ready to go, that burned down. We had a lot of burns, especially in the Rockaways. AG: In the weeks after the storm, there were many businesses on Long Island that decided to close their doors for good. DS: One thing I’ll mention is that a lot of businesses got hurt much worse. They were either smaller, or they just didn’t… I mean people just decided to get out of business. They just left. But we were the first business back on this street. Probably took us six weeks to get back. So yeah, we got back. And what started to happen quickly is the interest in backup power in solar power spiked. AG: Backup solar systems include batteries that allow the power to stay on even if the grid is down. But these backup batteries can cost just as much, or more, than the solar system itself. As a result, backup is still a fairly small percentage of Empower’s business. David told us that maybe 5% of the several hundred solar systems that Empower will install this year will have backup. But that’s still a significant increase from pre-storm sales, when almost no one was interested in solar backup. David has noticed a change in attitudes about solar since he left his job on Wall Street to found Empower a decade ago. DS: Now, I walk around and I go to social settings, and people say, you may not be that crazy after all. Ten years ago, they’re like, who’s this freak? He left his high-paying job to do this. What an idiot. So. Jury’s still out about the decision. But, at the end of the day, what we do is becoming part of the essential infrastructure. We’re building power plants, that’s what we do. Over time they’re going to become primary power plants, now they’re supplemental. AG: We asked David what his primary motivation was for founding Empower 10 years ago, when most people he knew still thought solar was a bit of a crazy idea. DS: The fundamental reason for me to care about renewable energy is that I think it’s dramatically going to improve the standard of living. Dramatically. Because it’s cheaper energy, it’s cleaner energy. We have one of the dirtiest power plants on Long Island here, just a few miles north. And these power plants are so bad for us—just the pollution part of it. The toxicity. The VOCs. All this stuff. It’s horrible. The mercury. The mercury, God. We’re killing ourselves. We’re just killing ourselves. AG: So what about the economic piece of the equation? David told us that the typical payback for residential solar is four to six years, but most of Empower’s clients finance with a solar lease, and with that, you start saving right away. DS: People are just concerned about this: what’s is my pocket? How am I getting richer? Yes, with solar you’ll save right today. And you’ll make money. And we’re there now. So it’s good for you. Today. AG: We were surprised that David hadn’t mentioned combating climate change as a reason for moving towards renewable energy. So we asked him what he thought. DS: A wise man taught me once that we have to prioritize. Prioritization, for me? Economic security, national security, and pollution are huge. But no doubt I want to try to curb greenhouse gases. I just don’t personally think it’s in the top three or four reasons. To me, reducing greenhouse gases gets achieved by achieving all these other things. AG: The role of solar as both a low-carbon form of energy and as a distributed form of energy that—when installed with backup battery—can stay on during storms may become increasingly important as we move towards a new climate reality. Even aside from Hurricane Sandy, Long Island has experienced an unusual number of extreme weather events in the last decade. DS: My dad grew up here. My grandfather came here after World War II. ’54 there was a bad flooding. But not nearly this. We’ve had to bunker up this office three times in the past two years. And so, yea, it seems something’s off. AG: We asked David how things are going now that it’s almost eight months after the storm. DS: I took about two months off after the storm. After we recovered, I needed time off. I lost it a little bit. I’ve been through a disaster before. I was downtown on 9/11. And I did not respond well. It’s funny. After everything passed, after we were back up and running, that’s when I just needed to cool down. AG: So David is now back at work at Empower, and the business is going strong. But the possibility of another storm is always front of mind. AG: If you’re on an island and you can’t get to the building, right? DS: Right. If you have to swim. I mean, if you have to swim to Starbucks, that’s a problem. Which is what you had to do here. Which was very upsetting. (laughs) It’s a severe response. So, we are looking for real estate north of Sunrise Highway to expand the business. And I’m upset about that. I love the South Shore. People love the South Shore. We’re a beach community. We have a volleyball team. This is in our blood. And I feel close with everybody here. That’s the benefit. We lost our boardwalk. But what’s happened is, now we have to walk through the neighborhood. So we’re getting to know our neighbors. AG: From Island Park, New York this is Allie Goldstein and Kirsten Howard. Thanks to David Schieren for sharing the story of Empower Solar with us. 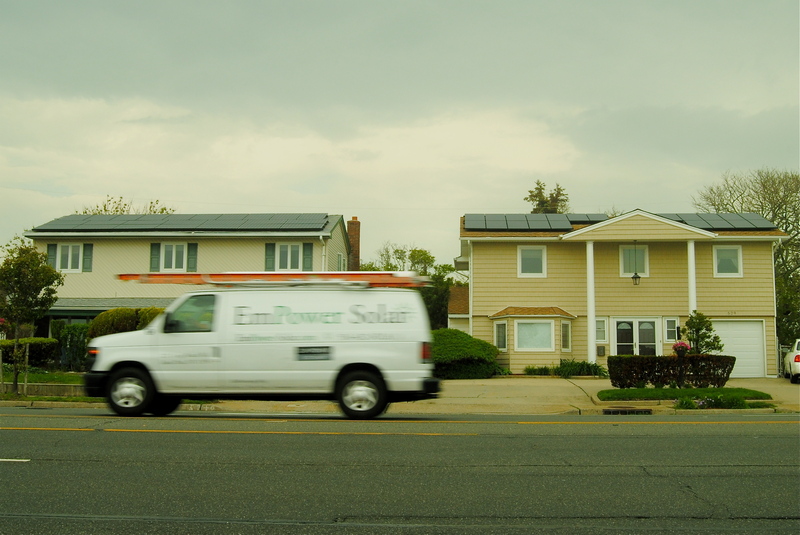 An Empower Solar van flys by side-by-side solar installations in Island Park, New York. Great podcast and story (with excellent sound quality and narration). Interesting that reducing GHGs is not a primary motivation for Schieren but a co-benefit. I suspect there are many others for which this is true. In some ways motivation seems irrelevant….